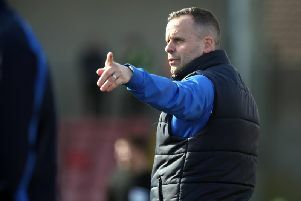 Temporary Glentoran boss Roy Coyle insists his boys must stand up and be counted in tomorrow’s Danske Premiership clash against Ards at the Bangor Fuel Arena. Coyle has once again stepped in to steady the ship following the shock resignation of Alan Kernaghan. The East Belfast team have managed to reel in a mere six points from their five league starts, leaving them hovering above the relegation strugglers. It’s a scenario Coyle intends to address. “It has been a troublesome opening to the campaign, with big Alan leaving,” said the veteran stand-in manager. “It’s always upsetting, but I have tried to keep the players focused on what they do on the park and divorced from off the pitch matters. “Once they cross the line on Saturday, it’s then up to them. A lack of consistency has been the problem, not only of late, but throughout most of last season. So, it’s about getting them in believing in themselves. It certainly will not be easy at Ards. “I took in their game with Crusaders last week and they were really unlucky to lose deep into injury time. “A lot of credit must go to their manager, Naill Currie. He has brought in a lot of experienced journey men in terms of Irish League football. They are all working for each other. The experience blends well with the youth in the side which is a good cocktail. Coyle is awaiting news on striker Curtis Allen and midfielder Marcus Kane, both didn’t train this week. “Curtis has been to hospital with a bad mouth abscess,” added Coyle. “Marcus was down with foot poisoning. So both could well be missing,” added Coyle. Currie will be without midfielder Gareth Tommons, who was dismissed in last week’s game against the current champions, Crusaders, while David McAllister is an injury doubt. “I though the sending off -- and that of David Cushley -- was rather harsh,” said Currie. “A yellow card would have been suffienced in both instances. “The players did fantastically well . . . I couldn’t really have faulted them last week. We switched off for a few seconds on 93 minutes and were punished by Jordan Owens.